UNSW scientists have developed a new carbon-based material that could revolutionise moisture control in applications as diverse as electronics, packaging, air conditioning – and keeping footwear fresh. UNSW scientists have developed a new carbon-based material that could revolutionise moisture control in applications as diverse as electronics, packaging and air conditioning – and which could even be used to keep footwear fresh. The new super dessicant, made from graphene oxide, significantly outperforms current drying agents, and is twice as absorbent as the industry standard, silica gel. The material was developed by a team led by Dr. Rakesh Joshi of the UNSW School of Materials Science and Engineering, and a study outlining its performance in laboratory tests is published in the journal Chemical Science. "This is a stable new material that shows significant gains in adsorption capacity over conventional desiccants," says Dr. Joshi. "One novel application we are investigating is the integration of the desiccant into inner soles of shoes to control odour and moisture. As the moisture could be released back into the atmosphere using an ordinary household device like a warm oven, shoes could be recharged regularly to keep them constantly fresh." The super desiccant is based on graphene – an extremely thin form of carbon – and is made of layers of graphene oxide. The researchers showed the material's extraordinary adsorption and desorption rates were due to the high capillary pressure in the laminates and tunnel-like wrinkles on their surfaces – processes which had not previously been understood. The project was conducted in collaboration with the computational materials design team of Professor Sean Smith, who was previously at UNSW and is now Director of Australia's National Computational Infrastructure. 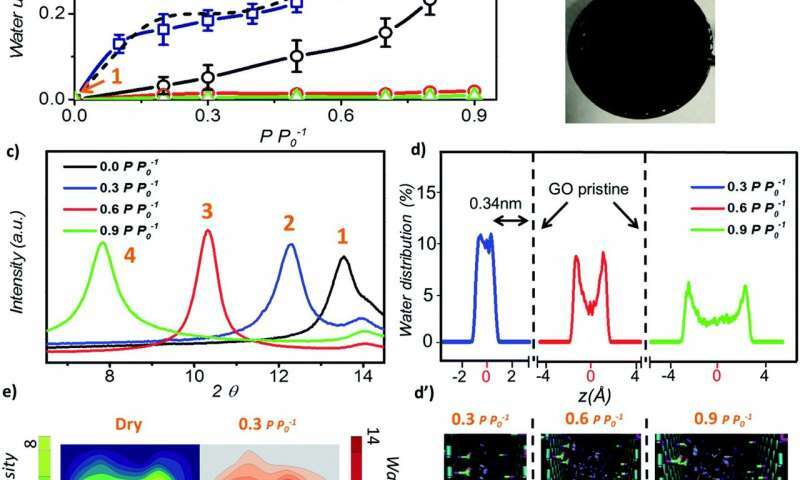 The researchers say the ability to fine-tune the spaces between the layers of graphene oxide as desired will allow the development of customised dessicants to control moisture across multiple applications. "Simulations of the microscopic components of this breakthrough dessicant material reveal remarkable insights into how it works and will underpin the next stages of design and development," says Professor smith, a world renowned scientist in developing theory. The new desiccant can also discharge moisture at energy-saving low temperatures, enabling it to be easily used over and over again. By contrast, the heating required to regenerate conventional desiccants is often considered prohibitively expensive. Study co-author, UNSW Scientia Professor Veena Sahajwalla, says: "This combination of high adsorption capacity and a rapid rate of absorption can significantly increase the efficiency of any desiccant system. "Likewise, the relatively low temperatures at which discharge can be achieved offers significant advantages by greatly reducing the energy intensity required for regeneration."